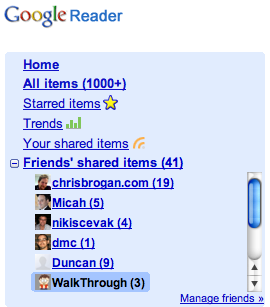 Is Google Reader Sharing Too Much? A small privacy debate is igniting over a new sharing feature in Google Reader. A couple weeks ago, Google turned on a new feature in its feed reader that lets you share posts with anyone in your Gmail or Gtalk contact list (assuming you use either of those other Google services as well). The problem is that sharing is an all-or-nothing proposition. You either share posts with all of your contacts (who also use Google Reader) or with nobody. In other words, sharing is the same as making your selections public. There is no way to pick and choose with whom exactly you want to share particular posts or feeds. Without giving consumers that granular control, the sharing feature is in danger of becoming a spamming feature. Just because I’ve sent you an e-mail in the past does not make us friends, and it certainly does not mean that you want to keep track of every random blog post I decide to share. If that happens and I become too generous in my spreading of ephemera, Google Reader does let you hide the posts that I or any other particular contact is sharing. But it does not let you block or specify who can see what you want to share. How hard would it be to turn that around and let you block certain contacts from being able to see your shared posts or to create different private sharing groups? If we’ve learned anything from Facebook’s Beacon experience, it is to give users of social services as much control as possible over who can see their data. To be clear, Google Reader is not broadcasting every feed you subscribe to out to your entire contact list. The default is to keep everything private until you deliberately click the “share” button. But once you do that, you lose control over who gets to see what. The appeal of this approach is that it is an effortless way to discover what a subset of people you know are sharing. But it might also create privacy issues for people who do not understand exactly how it works . There is a creepy surveillance aspect to this that might also turn some people off, or keep them from sharing anything at all.